While your sprinkler system may not seem like the most complicated thing there is, there’s a lot more going on below the ground than you might realize. Sprinkler systems consist of many different components to ensure that it not only functions properly but safely as well. One such component is the backflow preventer. Backflow preventers are devices that are used at the part of your plumbing system where your potable water supply is connected to a non-potable water source. Because the water that you’re using in your sprinkler system can contain a variety of contaminants, from fertilizer to pesticides, the last thing you want is for it to back up into your potable water supply line. 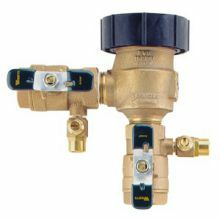 The backflow preventer is a one-way valve that ensures that the water used for your irrigation system only flows one way. This prevents potentially contaminated water from flowing back into your drinking-water supply. As you can imagine, the backflow preventer is extremely important to the health of your household, which is why you should have backflow testing done on a regular basis. In fact, backflow testing is required by the Ohio EPA (Environmental Protection Agency) administrative code at least once a year. First of all, if your sprinkler system lines are connected to your home’s potable water supply lines, then you have to have a backflow preventer installed. If you just had an irrigation system installed and the lines connect, you’ll be required to have a backflow preventer as well. When we install backflow preventers, will test them to make sure that they work upon installation. Once it’s installed and working properly, you’ll need to test it once a year from then on. The only thing that you’re required to do is to set up an appointment to have your backflow preventer tested. As long as the water is on to your sprinkler system, then you don’t even have to be home. We will inspect the backflow preventer to make sure it’s in good condition. If it’s damaged or has experienced wear and tear that could potentially affect its ability to prevent backflow, then we’ll either repair it or replace it. If we test the backflow preventer and it fails the test, we’ll replace it as well. If a new backflow preventer needs to be installed, we’ll make sure that it’s correctly implemented and will re-test it to make sure that it’s functioning properly. We are extremely familiar with all types of residential irrigation systems, which means we’ll have no trouble installing, repairing or replacing your backflow preventer if needed. When scheduling a backflow test, it’s important that you find a service that is properly certified by the state. Here at Sprinkler Pro, we employ backflow testers that are certified by the state of Ohio. If you want information about installing a new irrigation system in your Northeast Ohio home or need to schedule your annual backflow test, then be sure to contact us at Sprinkler Pro today.